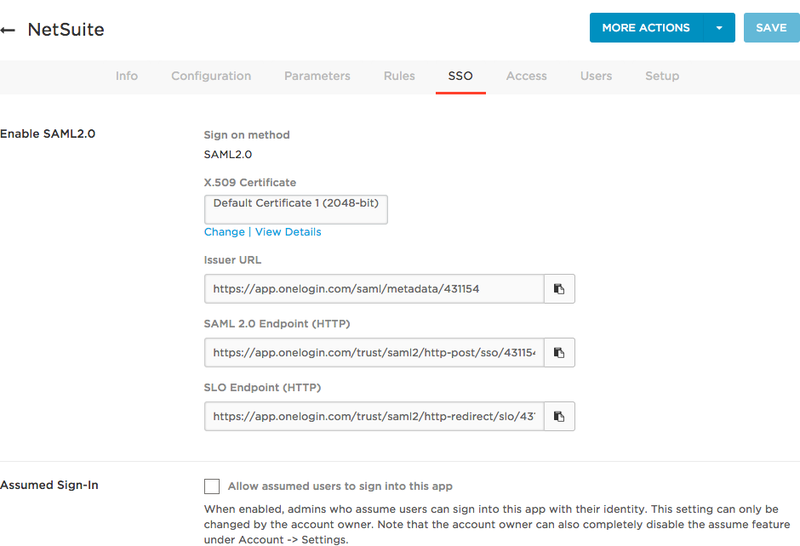 This topic describes how to configure OneLogin to provide SSO for NetSuite using SAML. If you want to set up SSO for NetSuite with form-based authentication, see Adding a Form-Based Application. Search for NetSuite and select it. On the Configuration tab, enter your NetSuite account information. For Endpoint URL Subdomain, select na1 unless told otherwise by your NetSuite support team. Under Account ID, enter your NetSuite Account ID. Go to the Parameters tab to map NetSuite user attributes to OneLogin attributes. Department -No value- This value can be provisioned. See Provisioning for NetSuite. Employee ID -No default- This value can be provisioned. See Provisioning for NetSuite. Hire Date -No value- If you want to provision the custom user field of Hire Date to your NetSuite users, you can select the field by clicking the Hire Date row. For instructions, see Provisioning for NetSuite. Note: This requires your account to support Custom User fields. For more information, see Custom User Fields. Password SSO Password SAML-enabled apps use the OneLogin password as the app password. Role -No value- If you want to provision users as members of a NetSuite Role, you can specify available Role values here by clicking the Role row. For instructions, see Provisioning for NetSuite. On the Access tab, assign the OneLogin roles that should have access to NetSuite and provide any app security policy that you want to apply to NetSuite. On the SSO tab, copy the SAML2.0 Endpoint (HTTP) and SAML Issuer URL. Log into the NetSuite admin dashboard. In the navigation menu, click Setup to configure SAML. Go to Integration > Single Sign-on Tasks > SAML Single Sign-on. Enter your OneLogin SSO connection information. In the Identity Provider Login Page field, enter your SAML HTTP Endpoint URL. 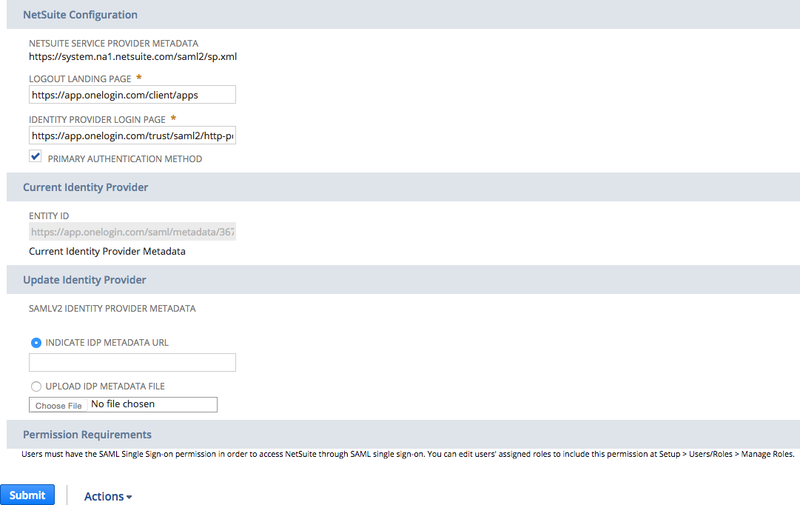 In the Indicate IdP Metadata URL, enter your SAML Issuer URL. This will automatically update the Identity Provider with the latest issuer URL and will be represented accordingly. Select the navigation menu and click Setup to configure NetSuite Roles. Single sign-on for NetSuite is configured on a role-by-role basis, meaning each role in NetSuite needs to be configured individually. Go to Users/Roles > Manage Roles. 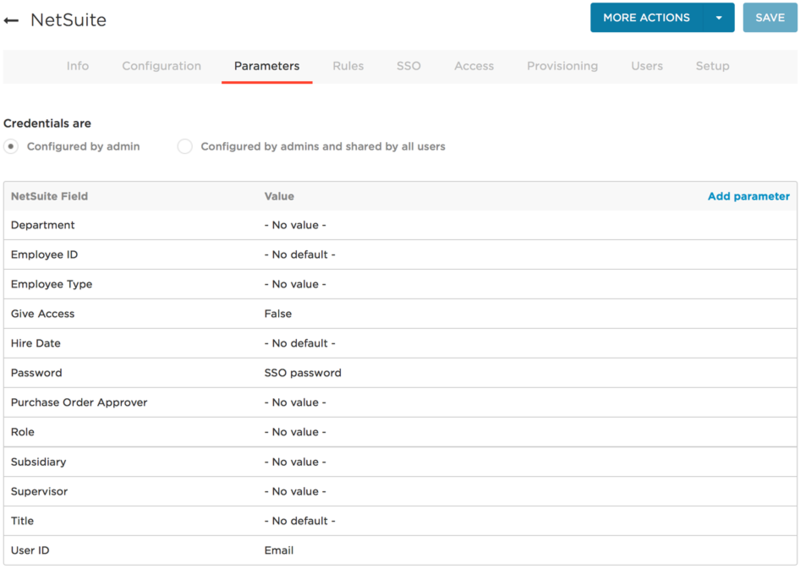 Select the Role you want to configure for SSO and click Edit. Under Permissions, search for SAML Single Sign-on and then click Add. Ensure Level is set to Full. Repeat section 4 for each NetSuite Role you want to enable SSO for. OneLogin and NetSuite should now be connected through SAML. Select NetSuite to open the Edit Login pane. Overwrite the default NetSuite login fields with the correct credentials.